Ailbhe's sister Izzy rocking a Brosmind design. 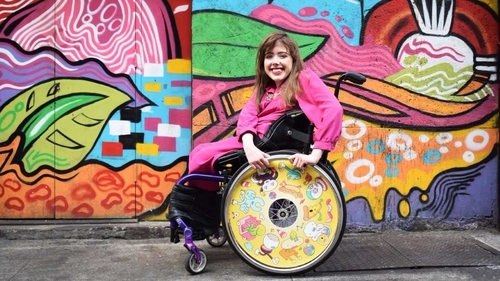 Last year, Ailbhe Keane set about designing personalised art for her sister Izzy's wheelchair. Now, famous artists and designers including Maser, Brosmind, Orla Kiely and Bodil Jane are getting involved. Where did the initial idea come from for this project? The idea for Izzy Wheels was inspired by my little sister, Izzy, who was born with Spina Bifida. She is paralysed from her waist down and has been a wheelchair user all of her life and growing up she found it very frustrating that there was nothing available for her to personalise her chair. I came up with Izzy Wheels as my final year project in The National College of Art and Design in 2016. I wanted to empower the lives of wheelchair users to be able to express themselves. A person's wheelchair is the first thing that people notice about them but it isn’t a true reflection of who they are or their personalities. Society has very negative associations with wheelchairs so together, my sister and I, set out to break this mindset down. Izzy Wheels allow users to match their wheelchairs to their outfits and make a statement about themselves. What issues did you find with the custom services already available? Right now products associated with wheelchairs are very clinical and medical looking. Wheelchairs are extremely expensive devices and look the same as they did 100 years ago. The limited range of accessories for wheelchairs currently available on the market is designed for either little children or very elderly people. Where do you get the inspiration for the various styles and designs on the spoke guards? I have always been very passionate about art and making since I was a little girl. I wanted to be an artist for as long as I can remember! Going to art college was a very natural decision for me. My mother's passion for gardening and flowers, I think, has had a major impact on my love of colour. As an Artists or Designer, you are always looking to work on projects that resonate with people and make a difference to their lives. I have always wanted to use my creativity to somehow make a difference to my sister's wheelchair. Applying designs to her wheels, which were like round blank canvases, seemed like a fun and interesting place to start. I began by trying out lots of different mediums. I started off by making all sorts of mad things like 3D pop out wheels, animated wheels, optical illusions and I really enjoyed experimenting. The product solution which was most simple and effective was flat round designs which you could apply any type of print to. Once I started selling online and the demand started to quickly grow I decided to broaden our range of styles of spoke guards in our collection. I reached out to famous Irish designers and told them about our story and mission. The response was overwhelmingly positive and designers were keen to help and get involved. We teamed up with the Irish Wheelchair Association and put on a wheelchair fashion show to launch our designs and named the collection and event ‘Roll Models’. The collection was a huge hit and gained us massive exposure throughout Ireland and across the globe. It was such a hit here that we decided, why stop at Ireland? For our latest collection which we just launched we collaborated with famous Artists, Designers, Illustrators, Print Maker and Graffiti Artists from all over the world. Some big names in the lineup included Maser, Brosmind, Steve Simpson, Chris Judge, Bodil Jane and later this year we are launching designs by one of the world's most famous print designers, our very own Orla Kiely. The designers were all given an open brief and told that have creative freedom over their design. This meant that we got an incredible and diverse range of artworks which we loved. For a designer, creating an Izzy Wheel is a dream brief. Being able to design on something that is circular is unusual and what’s also interesting is that the design spins around so it has to look right side up even when it's upside-down! Is there demand on a national and international level? Right now there are 40,000 wheelchair users in Ireland, 640,000 in the U.K. and 10.5 million across Europe and the US. A video about Izzy Wheels went viral on INSIDER art last month and received 2 million views in 24 hours and 11 million views in one week. We were then contacted by Instagram's head office in the states who spotted our page and asked if Izzy Wheels would be @instagram's story for 25 hours (224 million followers). Since then 80% of our sales are now coming from the USA which is very exciting. Do you see the brand expanding into other mobility assistance devices such as crutches or scooters? We are creating a fashion brand for wheelchair users, a very overlooked and underserved community of people. Our focus right now is on wheelchairs but we have been receiving an incredible amount of messages from people with all sorts of disabilities and medical device users. We have big plans to expand our range to cater to these people in a new and stylish way. You won the leaders of tomorrow award and were awarded funding by Enterprise Ireland. Though it originated as a college project, do you see the business continuing to evolve into the future? Upon finishing college, Izzy Wheels was a college project but it already embodied all of the backbones of a business. All it needed was some help to drive it commercially. I was accepted into Enterprise Ireland’s New Frontiers Entrepreneur Development Program where I received business training, mentoring, funding and an office space. That’s where I learned how to bring my business to life and start driving traction and revenue. We entered ourselves into a few competitions to meet some other entrepreneurs and gain some exposure for Izzy Wheels. We had no idea how well we would go down in the competitions! We scooped up a number of big awards including first place in the Accenture Leaders of Tomorrow Award which has dramatically boosted our profile and earned us a spot in NDRC, Europe’s number 1 Accelerator Program. We have started the program and are now based in NDRC where we are surrounded by incredibly passionate and driven entrepreneurs which is very inspiring and motivating. As a business, we are constantly growing and learning. We are passionate and driven women on an important mission. We want to maximise this opportunity to have our voices heard and empower wheelchair users around the world to embrace their disabilities and never let it hold you back. We are planning to create a whole range of accessories for people with disabilities so that they can feel confident in who they are and equally considered by society. Where did the slogan, "If you can’t stand up standout" come from? Our tagline was one of the first things that we came up with. It has been the foundation for the entire brand. Standing out for all of the right reasons is what we are all about. I understand that you are working with children in a Wheel design workshop. How have they reacted to the prospect of such an artful wheelchair? We ran Wheel-Design workshops with the children in the Central Remedial Clinic in Clontarf last year. We gave the children in the class the opportunity to design their own wheels or create designs for one of their friends who used a chair. We got the girls from a local secondary to help us out which was lovely. Their teacher, Lorraine Byrne, said she had never ever seen the children so engaged in a class before. It was really special and we plan to run more wheel design workshops with children later this year. How do you feel transforming the wheelchair from simply functional to fashionable and functional affects user’s confidence and the public’s perception of wheelchair users? Izzy always says that she loves her wheelchair. She hates when people feel pity towards her because she is in a wheelchair. People often think that wheelchairs are something unfortunate. In fact, wheelchairs are incredible devices because they give people who can’t walk their freedom. Without a wheelchair, my sister and millions of others would not be able to get around. A wheelchair needs to be admired and respected. Able-bodied people used to feel pity towards my sister when they saw her in her wheelchair, now they are running over to her and telling her how much they love her chair. Izzy Wheels break down the negativity and opens up people's minds and perceptions. If you want to find out more about Izzy Wheels, you can find their website here.